With the Stake-Pro Dead Blow Post Driver you can drive as many posts as you need, safely and efficiently. This manual post driver is ergonomically designed to protect your hands and wrists, even over long-term use. (Please wear proper safety gear when driving posts.) 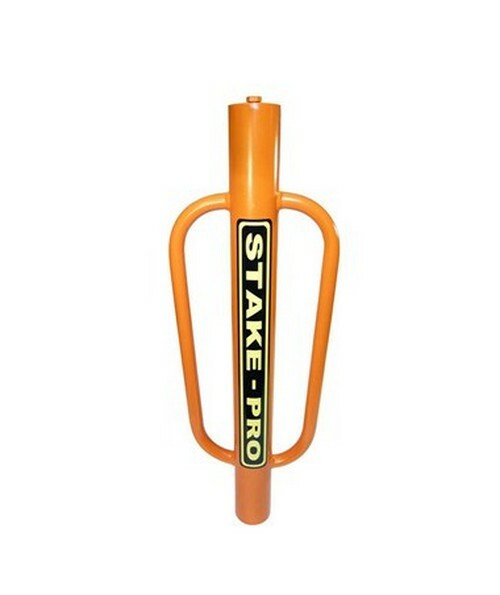 The Stake-Pro post driver has a continuous steel shaft that fits securely over posts up to 2½” in diameter. The impact of each hammer blow is transmitted along the Stake-Pro, increasing your striking force up to 40%, for better angle control and accuracy with less effort and noise. This dead blow hammer virtually eliminates splitting of your posts and stakes, decreasing waste and frustration. 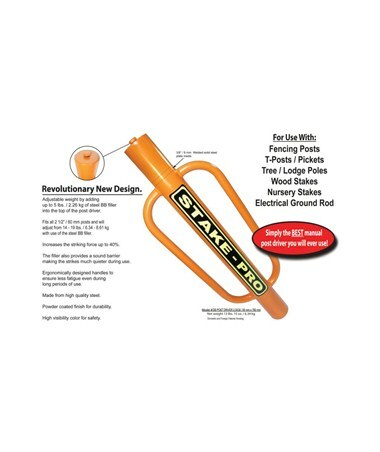 The Stake-Pro is 30" long, so no more bending and stooping to drive your posts. Weight is adjustable from 14 to 19 lb by adding up to 5 lb of steel BB filler into the top part of the post driver. The increased weight of the filler is contained by a 3/8” (9 mm) welded steel plate. The bright yellow orange powder coat finish is easy to see for better safety.